During the course of our building surveys as surveyors we look and examine the floors and we open them up if at all possible without causing damage (with the owners approval of course) as floors often show the first signs of structural problems (when a floor bounces up and down) and even creaks can be indications of problems. 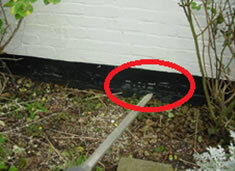 Also as we have been carrying out building surveys, also known as structural surveys, for decades we know the characteristics of various different types of properties and what to look out for when there are problems with floors. 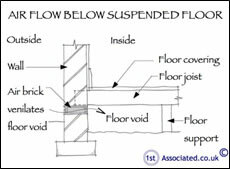 To discuss floors more please free phone a surveyor on 0800 298 5424. Within our reports we utilise a system of ovals and circles to highlight problem areas or characteristics within a property to better explain the issues. 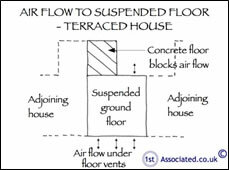 If this does not explain the issue completely then we can also use one of our sketches that have been commissioned exclusively for us for use in the reports. We have literally thousands of surveying articles to help you that we as building surveyors have produced over the years which explain the problems that can occur from having the wrong type of survey and which explain exactly how mortgage surveyors work as opposed to independent building surveyors or structural surveyors. Below is a selection but to see more go to www.1stAssociated.co.uk. What type of building survey or structural survey or building report do I need? Why have one of our surveys? Have a look around our website 1stAssociated.co.uk to see the quality of our articles, for example this one, and look at the quality of our surveys (we are more than happy to send you an example). We pride ourselves on our professional standard and easy to read reports which we have been carrying out for many years on every age, type and style of property across the UK. Free phone 0800 298 5424 for a friendly chat and we can give you an example of one of our survey reports.